The unemployment rate edged down to 5.6 percent in December from 5.7 percent in November (revised from an earlier reported 5.8 percent). However, the main reason was that 273,000 workers reportedly left the labor force. The employment-to-population ratio (EPOP) was unchanged at 59.2 percent, roughly 4.0 percentage points below the pre-recession level. The establishment survey showed the economy adding 252,000 jobs in December. With upward revisions to the prior two months’ data, this brings the three month average to 289,000. Some of the job growth in December was likely attributable to better than usual weather for the month. For example, construction reportedly added 48,000 jobs; restaurant employment rose by 43,600. But even without these strong gains, there was still healthy job growth. Manufacturing added 17,000 jobs, finance added 10,000, and health care added 52,000. Unlike prior months, the jobs in this sector were mostly (35,200) in the less well-paying administrative and waste services category. The health care sector added 34,100 jobs. 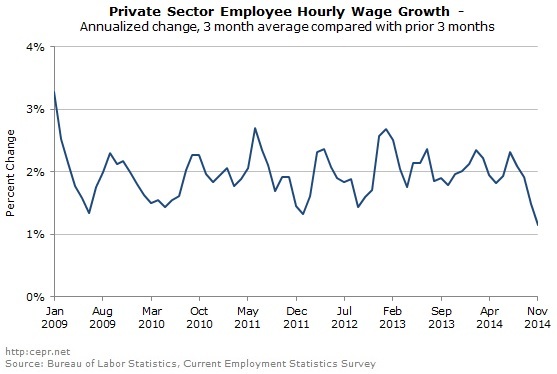 Job growth in this sector has accelerated sharply, averaging 36,500 over the last three months. By comparison, it averaged just 21,200 in the year from September 2013 to September 2014. Retail added just 7,700 jobs. This reflects the earlier than usual Christmas hiring which added 88,300 jobs the prior two months. The story on wages is less encouraging. The widely touted November jump in wages was almost completely reversed, with the December data showing a 5 cent drop from a downwardly revised November figure. The average over the last three months grew at a 1.1 percent annual rate compared with the average of the prior three months, down from a 1.7 percent growth rate over the last year. This may be due in part to a shift to lower paying jobs in restaurants, retail, and the lower-paying portions of the health care industry. However, it is also possible that we are just seeing anomalous data. 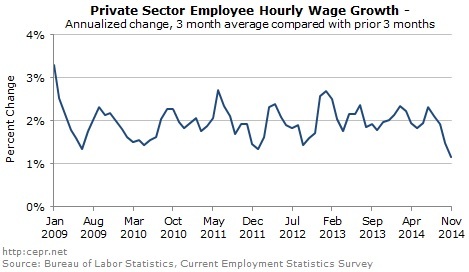 Nonetheless, the claims of accelerating wage growth have no support in the data. Interestingly, there seems to be some shrift to generally less-skilled production and non-supervisory workers. The index of weekly hours for these workers is up 3.6 percent from its year-ago level. By contrast, the index for all workers is up by just 3.3 percent. Since the former group is more than 80 percent of the payroll employees, hours for supervisory workers would have risen by just 2.5 percent. This is consistent with employment data showing much sharper employment gains for workers with high school degrees or less than for college grads. The EPOP for college grads is actually down by 0.2 percentage points over the last year. Other data worth noting in the household survey include a rise in the EPOP for African Americans of 1.8 percentage points over the last year and for African American men of 2.2 percentage points. The EPOP for African Americans is up by 3.9 percentage points from its low in 2011, although it is still down by 4.0 percentage points from pre-recession levels. The 10.4 percent December unemployment rate for African Americans is down from a recession peak of 16.8 percent. This report shows some evidence of the labor market impacts of the ACA. While the number of people choosing to work part-time was down slightly from its November level, it is still 1.1 million above its year-ago level. The number of people who are self-employed is also up from its year-ago level. Averaging the last three months, the number of self-employed workers is up by 480,000 (3.5 percent) from the same months of 2013. (It had been dropping in 2013.) Also, the over 55 age group comprised just 37.6 percent of employment growth in 2014, compared to an average of 65.3 percent in the prior two years. This could indicate that many pre-Medicare age workers now feel they can retire since they can get insurance through the exchanges. On the whole, this is clearly a very positive report with the strong December jobs number (even if inflated by weather) coupled with upward revisions to the prior two months. However, quit rates are still very low and wage growth remains weak. This should remind the public of how far the labor market has to go before making up the ground lost in the recession. Fiscal cliff concerns appear to have no impact whatsoever on hiring. Upward revisions bring the monthly rate of job growth to almost 150,000 since June.